Issaa had a plan. The oldest of six, he left his home in Niger at age 12, bound for Europe and a better life. “My father collected money for my journey, he wished me good luck and then let me go. Once I arrived in Libya, I started to look for a job." Determined to raise money for the next leg of his journey, Issaa found work on a farm. Despite a low monthly wage of $30, he was able to support himself — and put some money away. 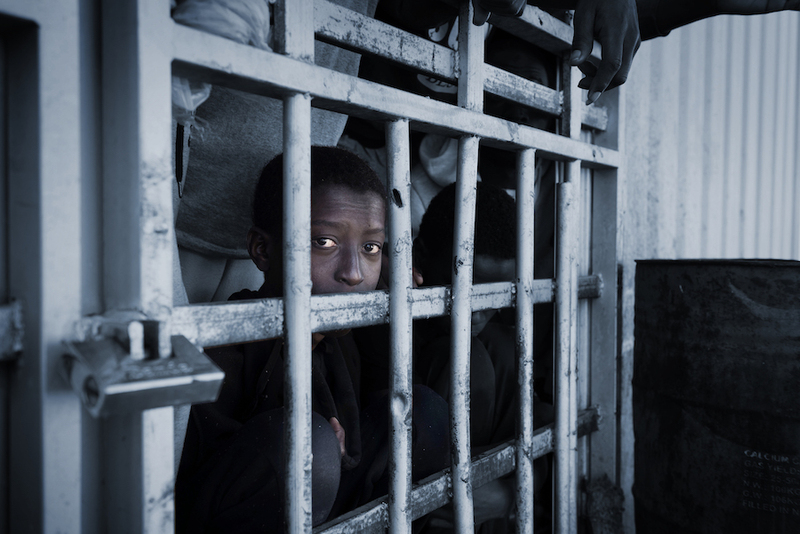 UNICEF puts the number of unaccompanied children in Libya at more than 14,000, and for some time, it appeared Issaa might be one of the lucky ones. He managed to save $450 for his journey — enough, he hoped, to pay for the boat crossing to Italy. But before he could book his passage, he was arrested and detained. The day UNICEF met Issaa, he was the youngest unaccompanied minor at the detention center, one of only a small number UNICEF is allowed to access. Issaa’s fellow detainees included ten women, three children and 51 men — a modest count considering the scale of Libya's detention policy. On average, the number of migrants in detention ranges from 6,000 to 7,000, depending on the season. Women UNICEF interviewed where Issaa was being held reported harsh conditions, including intense heat in the summer and cold in the winter and severe overcrowding. Sometimes as many as 20 migrants are crammed into cells only slightly over 21 square feet for long periods of time. According to UNICEF's November 2017 report Beyond Borders: How to Make the Global Compacts on Migration and Refugees Work for Uprooted Children, at least 100 low- to high-income countries detain children for immigration reasons. While no definitive data exists, the International Detention Coalition estimates there are currently 1 million uprooted children in detention— though many consider this figure to fall short of the real count. What is clear, however, is that detention harms children’s health and well-being and undermines their development. Here in the U.S., press coverage of the impact on children separated from their parents at the border since the Zero Tolerance policy went into effect has made that heartbreakingly clear. Extremely traumatic for parent and child, detaining children without their parents leaves them more vulnerable to abuse, exploitation and neglect. But family detention — indeed any denial of a child's liberty determined to be not in the child's best interest — also takes a serious toll. Though her husband didn't agree with her plan, Lucia, above, set out for Italy with her two children in search of a better life. When UNICEF workers met her, she and her two girls were behind bars at the Alguaiha detention center in Libya, which routinely detains foreigners without legal immigration status for up to 12 months. The conditions — poorly ventilated cells, inadequate sanitation and minimal to no medical care — are especially dangerous for children. But Lucia comes from Eritrea, where, she says, “It is impossible to have a normal life. This is why as soon as I get out of this prison I will try again to reach Italy." Libya isn't the only place detaining young migrants and refugees. Adolescents and youth on the move report being detained in European countries, too. In Hungary, legislation allows for asylum seekers as young as 14 to be detained, fear of which has driven many young migrants and refugees underground, where deplorable living conditions pose new threats. UNICEF is working with organizations around the world, including the International Detention Coalition, to raise awareness of detention's harmful effects on children, and to advocate for alternatives such as foster care, supervised independent living and community-based accommodations for families. While progress overall is slow and few countries have ended the policy of detaining children because of their immigration status, there are encouraging developments. In Egypt, for example, UNICEF and partners' advocacy campaigns succeeded in reducing both the duration and frequency of detention for 287 child migrants, nearly half of whom were traveling alone or had been separated from their families. In Mexico, UNICEF has worked hard to develop detention alternatives for children, like these Guatemalan boys, above, who were detained in Mexico after trying to travel to the U.S. In the state of Tabasco, UNICEF has helped implement ‘open-door’ shelters for migrant children and asylum seekers, where children can get medical care, emotional support and schooling along with legal assistance. In 2017, 481 shelter providers and social workers in Tabasco were thoroughly trained to meet the needs of 5,000 migrant children. In addition, the 837 migrant children who arrived in Tenosique and Tapachula were given case managers fully equipped to advocate in their best interests. In other gains, 40 public and private shelters received training to improve the standards of care for migrant and refugee children.